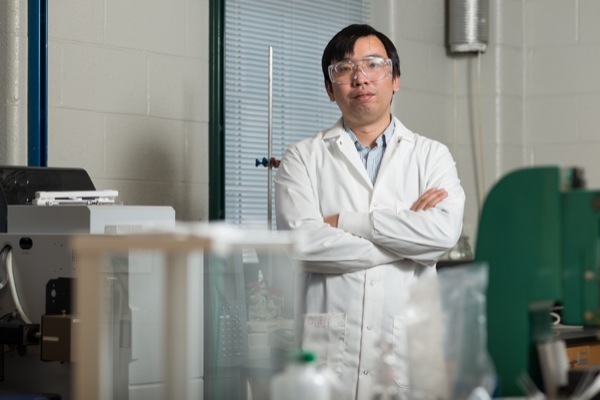 A UD engineering research team led by Feng Jiao has developed a highly selective catalyst capable of electrochemically converting carbon dioxide to carbon monoxide with 92 percent efficiency. A UD engineering research team led by Feng Jiao has developed a highly selective catalyst capable of electrochemically converting carbon dioxide (left) to carbon monoxide with 92 percent efficiency. 3:33 p.m., Jan. 30, 2014--A team of researchers at the University of Delaware has developed a highly selective catalyst capable of electrochemically converting carbon dioxide  a greenhouse gas  to carbon monoxide with 92 percent efficiency. The carbon monoxide then can be used to develop useful chemicals. The researchers recently reported their findings in Nature Communications. “Converting carbon dioxide to useful chemicals in a selective and efficient way remains a major challenge in renewable and sustainable energy research,” according to Feng Jiao, assistant professor of chemical and biomolecular engineering and the project’s lead researcher. Co-authors on the paper include Qi Lu, a postdoctoral fellow, and Jonathan Rosen, a graduate student, working with Jiao. The researchers found that when they used a nano-porous silver electrocatalyst, it was 3,000 times more active than polycrystalline silver, a catalyst commonly used in converting carbon dioxide to useful chemicals. Silver is considered a promising material for a carbon dioxide reduction catalyst because of it offers high selectivity  approximately 81 percent  and because it costs much less than other precious metal catalysts. Additionally, because it is inorganic, silver remains more stable under harsh catalytic environments. 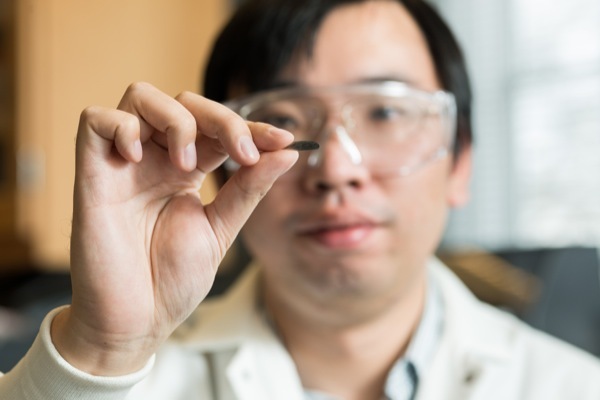 The exceptionally high activity, Jiao said, is likely due to the UD-developed electrocatalyst’s extremely large and highly curved internal surface, which is approximately 150 times larger and 20 times intrinsically more active than polycrystalline silver. Jiao explained that the active sites on the curved internal surface required a much smaller than expected voltage to overcome the activation energy barrier needed drive the reaction. The resulting carbon monoxide, he continued, can be used as an industry feedstock for producing synthetic fuels, while reducing industrial carbon dioxide emissions by as much as 40 percent. 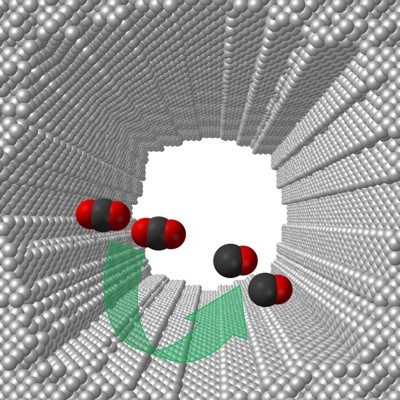 To validate whether their findings were unique, the researchers compared the UD-developed nano-porous silver catalyst with other potential carbon dioxide electrocatalysts including polycrystalline silver and other silver nanostructures such as nanoparticles and nanowires. 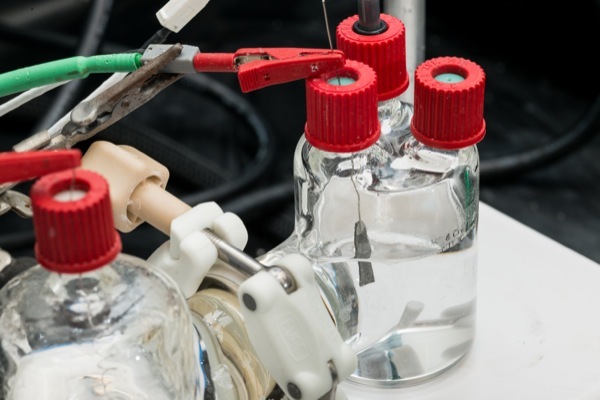 Testing under identical conditions confirmed the non-porous silver catalyst’s significant advantages over other silver catalysts in water environments. Reducing greenhouse carbon dioxide emissions from fossil fuel use is considered critical for human society. Over the last 20 years, electrocatalytic carbon dioxide reduction has attracted attention because of the ability to use electricity from renewable energy sources such as wind, solar and wave. Ideally, Jiao said, one would like to convert carbon dioxide produced in power plants, refineries and petrochemical plants to fuels or other chemicals through renewable energy use. A 2007 Intergovernmental Panel on Climate Change report stated that 19 percent of greenhouse gas emissions resulted from industry in 2004, according to the Environmental Protection Agency’s website. The research team’s work is supported through funding from the American Chemical Society Petroleum Research Fund and University of Delaware Research Foundation. Jiao has patented the novel application technique in collaboration with UD’s Office of Economic Innovation and Partnerships. Feng Jiao joined UD in 2010. In addition to his faculty role in chemical and biomolecular engineering, he is also affiliated with the Center for Catalytic Science and Technology. His research interests include developing clean, sustainable and environmental friendly energy supplies by combining catalysis, materials science and electrochemistry to address current energy conversion and storage challenges. Jiao’s previous work includes developing novel cathode materials to boost the energy storage of lithium-ion batteries, which are used in items ranging from laptops to electric cars, through a new synthetic method, ionothermal synthesis, for preparing lithium manganese phosphates with 3D nanoporous structures.